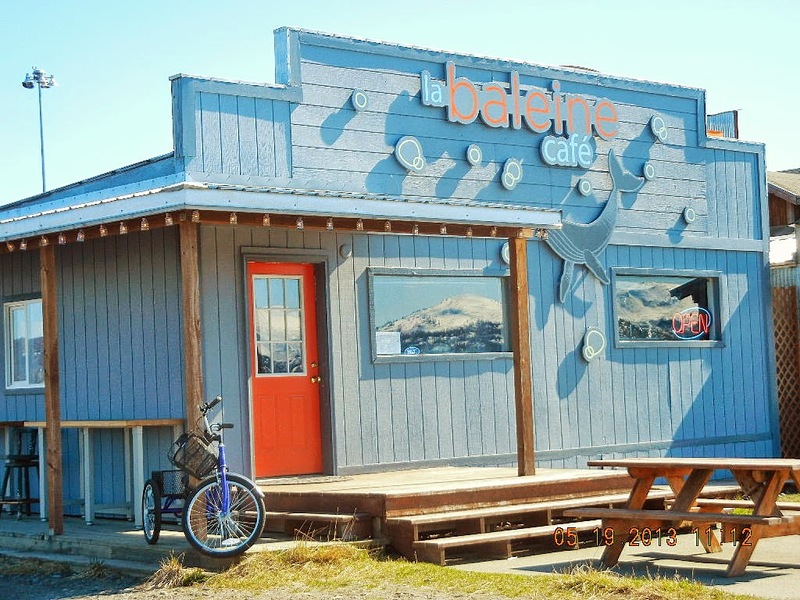 Mandy Dixon has just re-opened La Baleine on the Homer Spit (here’s my post from last year about the opening days). Go for absolutely fresh food, cooked to order, and beautifully presented. It’s easy to spot, on the left just past Salty Dawg Saloon as you’re headed toward Land’s End. 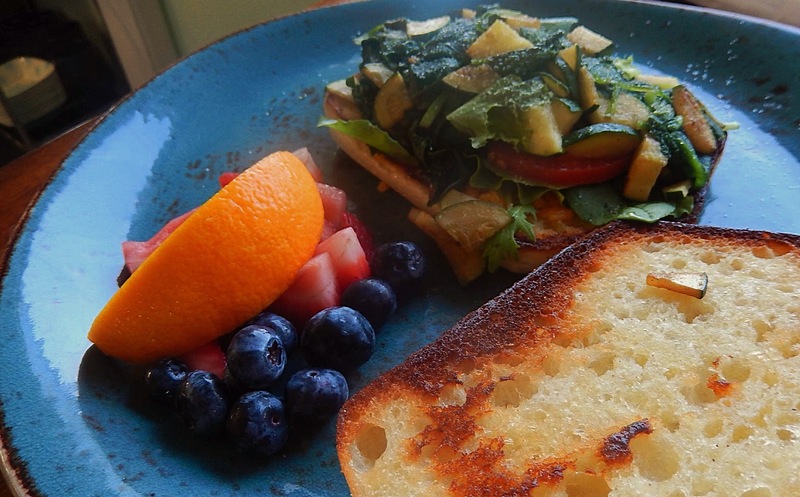 Best breakfast sandwich anywhere, the mostly veggie version with zucchini, mushrooms, greens. The meatier variation includes bacon, an egg, and cheese. The staff will make anything you like within this range. We ate Mother’s Day breakfast there, and in keeping with her generosity, Mandy served a small bag of mini-beignets drenched in confectioners’ sugar to each mom — enough to share, if one was so inclined. Unfortunately, I didn’t get a photo of them before they disappeared. 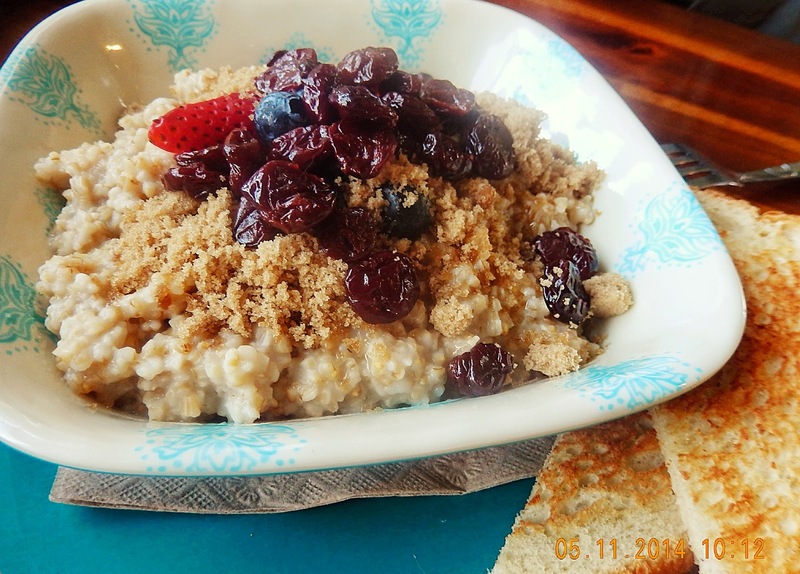 Jim’s oatmeal, with choices of fresh fruit, dried cranberries, brown sugar, cream, honey, and more for toppings. All of La Baleine’s dishes are unusual pottery, suitable for setting off the food. Scones made with the trademark sourdough in the bakery cabinet at Fresh Sourdough Express, Homer. Last year, Kevin and Donna Maltz sold Fresh Sourdough Express on the road to the Homer Spit and headed for a well-earned retirement. And at the end of the 2013 season, we saw signs saying that the restaurant was closing permanently. Imagine our delight then this past weekend to find the place open and bustling. 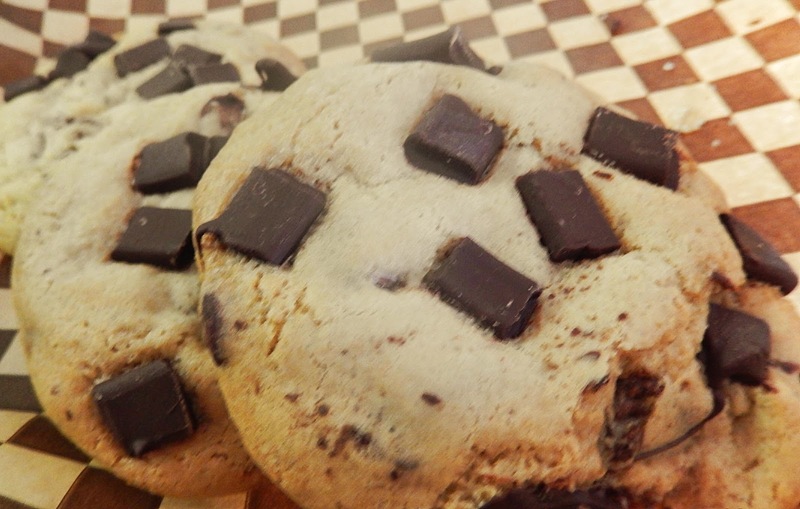 Chocolate chip cookies — indulgent, but Fresh Sourdough Express has plenty of savory specials as well. The menu has our favorite Mocha Milkshake (nothing like it anywhere else that we’ve been), Homer Spuds, and Sourdough biscuits. When we stopped by on Mothers’ Day, Donna personally made us a mocha milkshake, and said that they’re planning new treats for the menu. Check in with them at (907) 235-7571 for hours. And after you’ve had your fill of the delicious food, continue on to enjoy the Homer Spit, or Bishop’s Beach, or . . . there are many choices. 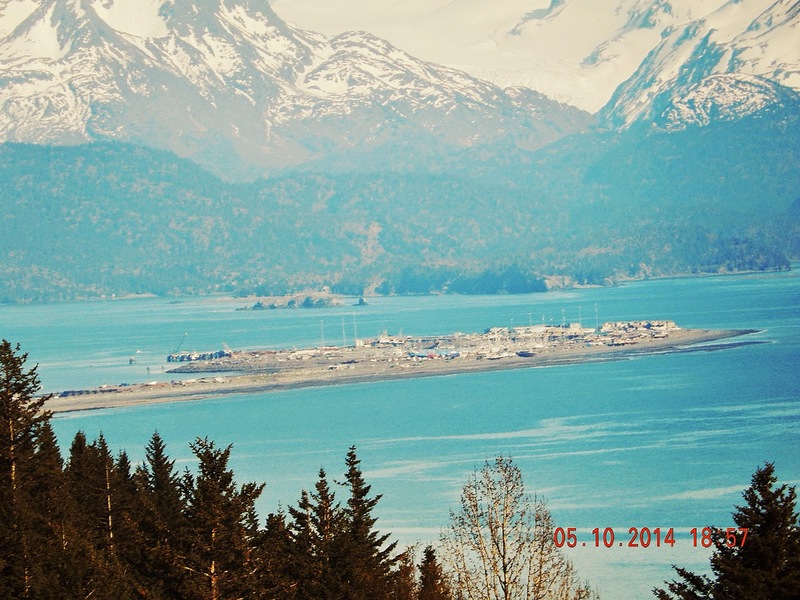 Homer Spit, from the top of the hill coming into town. My friend E.J. from Pennsylvania says these are the real deal. Having never eaten a Philly pretzel, I have no way of telling, but the ones he made sure tasted good, so I tried his recipe. 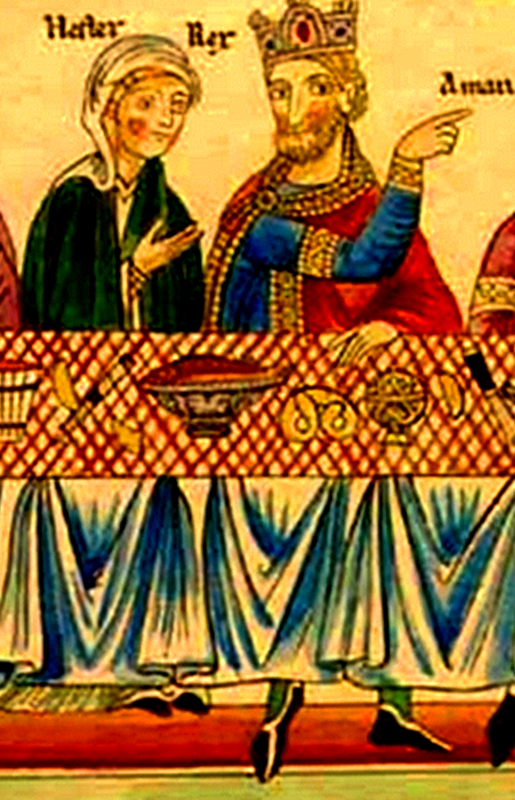 Painting from Alsace, 12th century C.E., may be the earliest picture of a pretzel (on the table). From http://en.wikipedia.org/wiki/File:Hortus_Deliciarum_1190.jpg. 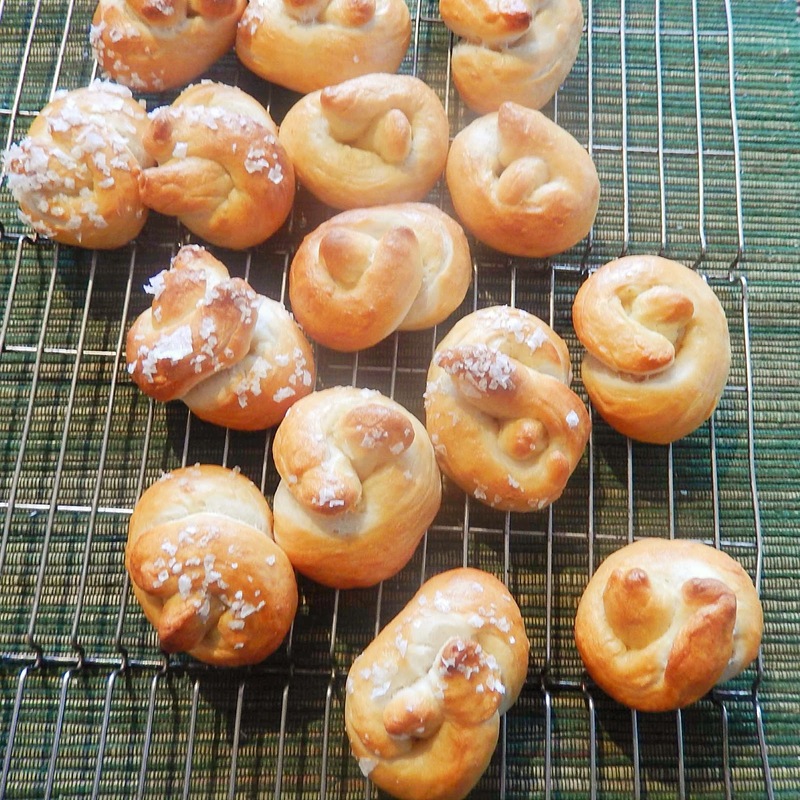 I reviewed pretzel recipes on a few web sites to see what the most important things about baking pretzels might be. Bottom line — boil or dip them briefly, in an alkaline bath (made with baking soda or lye; here’s a link to a discussion of the merits of each). That’s what makes them pretzels rather than bread. Boiling them helps set the proteins on the outside, limiting how much they can rise in the oven. That gives them a texture that’s denser and chewier than regular breads. They also are pretzels because of the way that they are traditionally twisted, representing someone praying according to many accounts They were good for Lent because Christians in the Middle Ages and Renaissance gave up all meat, dairy products, and fat for the forty days, and pretzels are just flour, water, and salt. Two answers to the bagel question were, a) some sweetening (often mixed into the dough), and b) some malt or malt syrup, either in the dough or in the water. 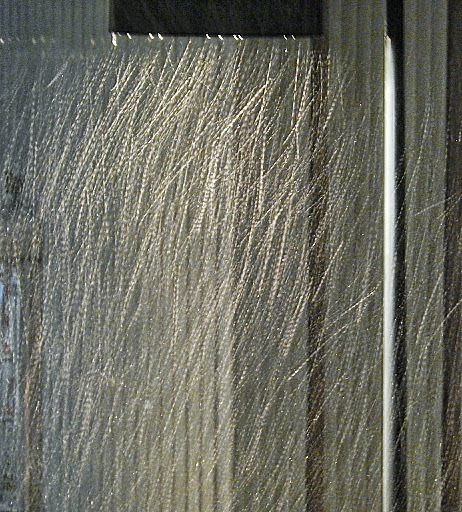 I didn’t have malt on hand, and impatient as always, didn’t want to go out for it. One recipe recommended boiling the bagels in sweetened water, so I tried that, and sure enough — they tasted bagel-ish, not pretzel-ish. On the other hand, as I read further, I found recipes for boiling bagels in water with baking soda (just like pretzels), or with nothing in the water, etc. 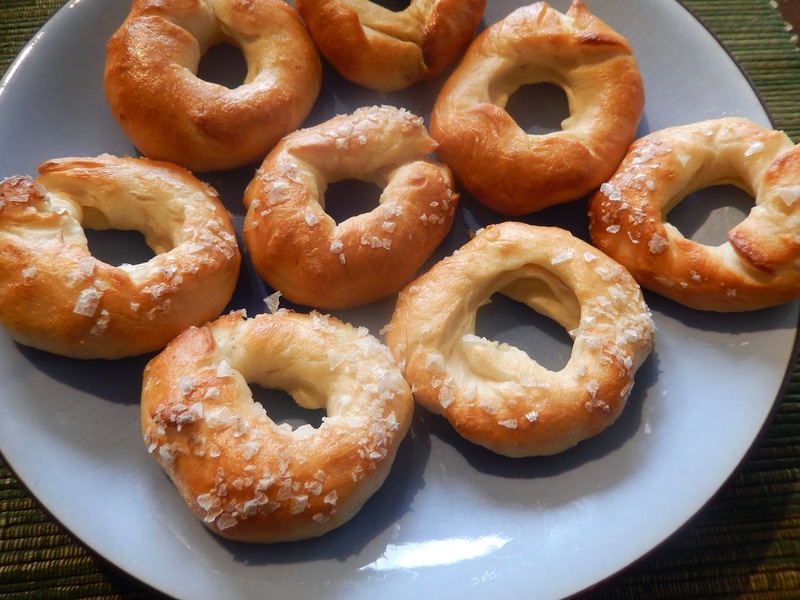 So the answer to the question of why is it a bagel rather than a pretzel (besides the shape) remains ambiguous, like so many culinary questions. 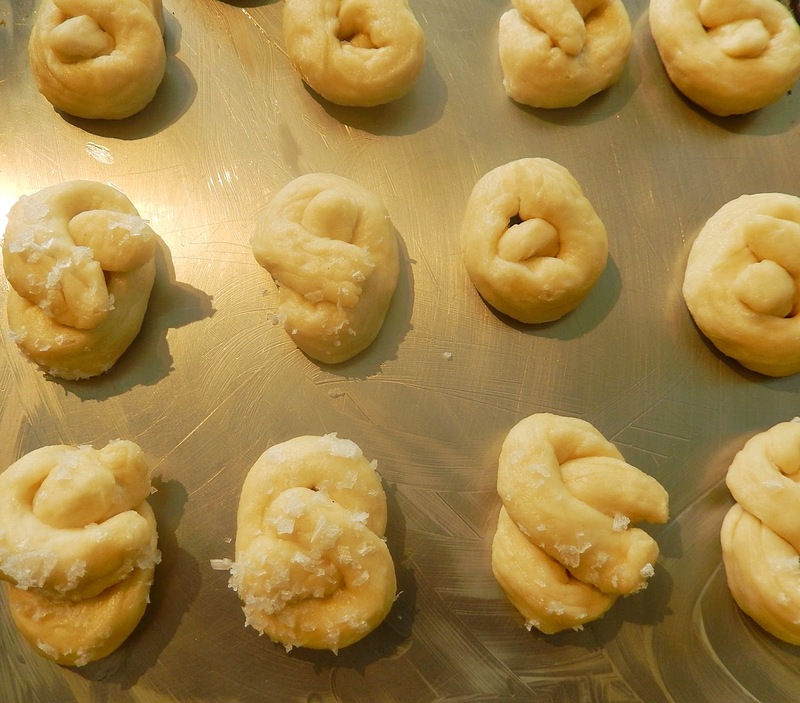 This recipe is a basic yeast dough — flour, water, salt. 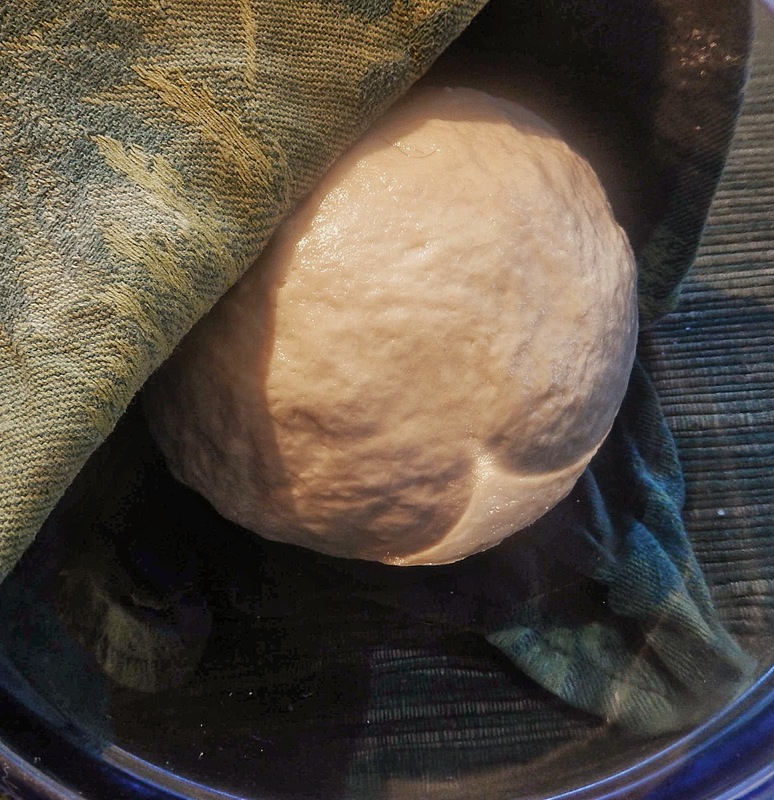 You’re kneading it; letting it go through a standard first rise (about an hour, until about doubled); cutting and shaping the dough (either pretzels or bagels); boiling it very briefly and draining it; baking in a hot oven; letting cool a bit before eating. Dissolve yeast in 1/4 cup of the warm water, and let stand for about 10 minutes until foamy. Stir in the rest of the water (one more cup). Mix 4 cups all purpose flour and salt in a large mixing bowl. Add the yeast in water and enough additional flour (or water, as needed) to make a stiff dough. 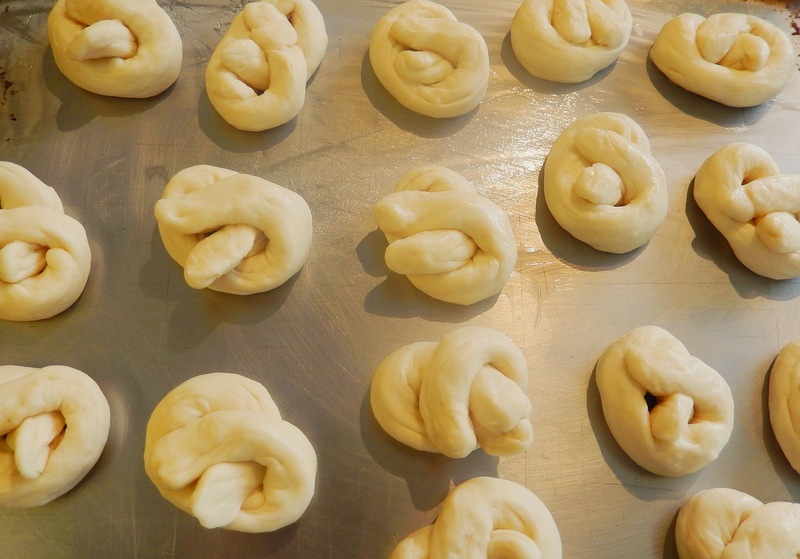 As with any yeast dough, the proportions of flour and water will vary somewhat depending on the season, humidity, and so forth). Knead dough for 10 minutes on lightly floured board OR until dough is elastic. Form the dough into a ball, coat lightly with butter, place in bowl. Cover the bowl loosely with plastic wrap and let rise for 45 minutes. Note that this dough only rises once. Bring to a boil 4 cups of water, and dissolve 4 Tablespoons of baking soda in it (for pretzels) or 1 1/2 Tablespoons of golden syrup (for bagels). 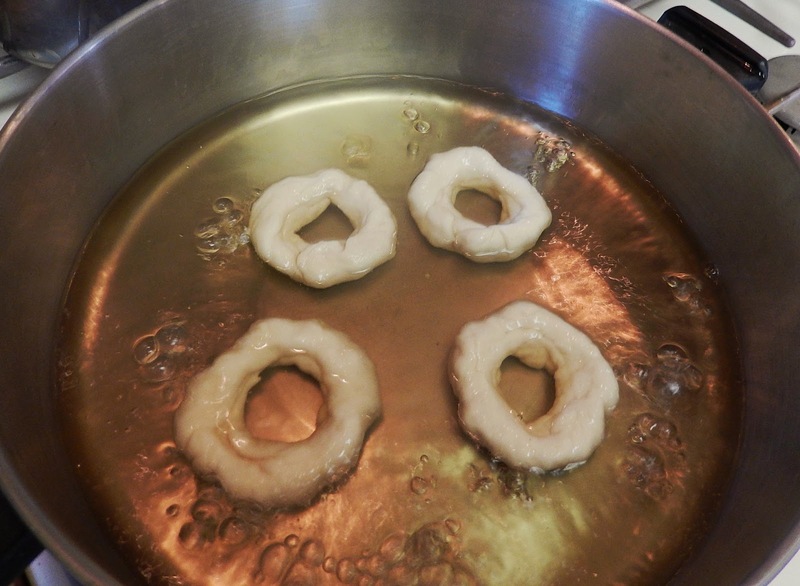 Drop pretzels into boiling water; fish them out after 5 to 10 seconds using a slotted spoon (the surface will look a little dimpled). Drain them on paper toweling, briefly, and put them onto the buttered baking sheet. Sprinkle with sea salt, to taste (Maldon flakes are a good size), or use kosher salt. Bake for 8 to 12 minutes OR until golden (start checking at 6 minutes). Cool on a rack. 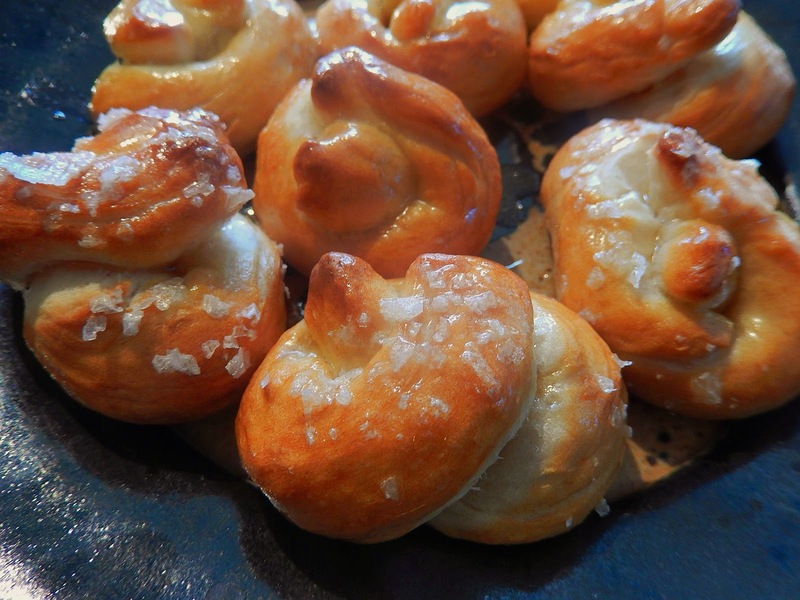 Pretzel as bakers emblem, traditional in Goerlitz, Germany. Easter: Besides being a Lenten food, in some places a pretzel was hidden, along with two hard-boiled eggs, for people to find on Easter. 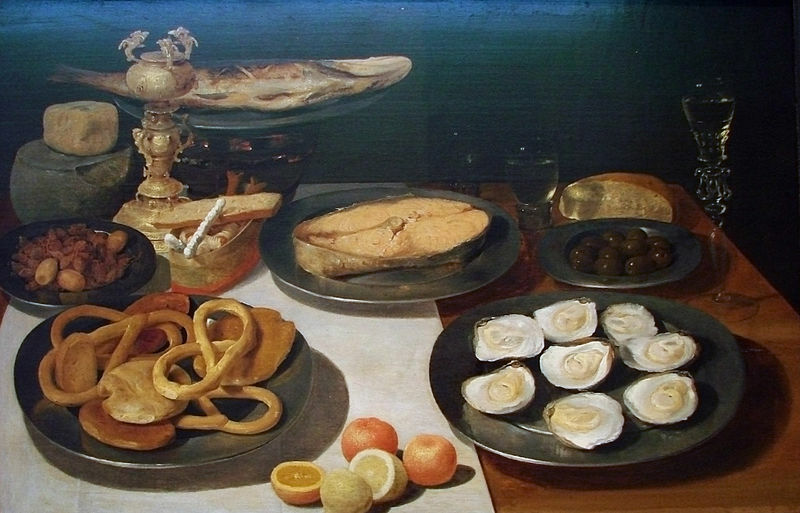 Jacob Fobsen Van Es Déjeuner Nancy (1596–1666). 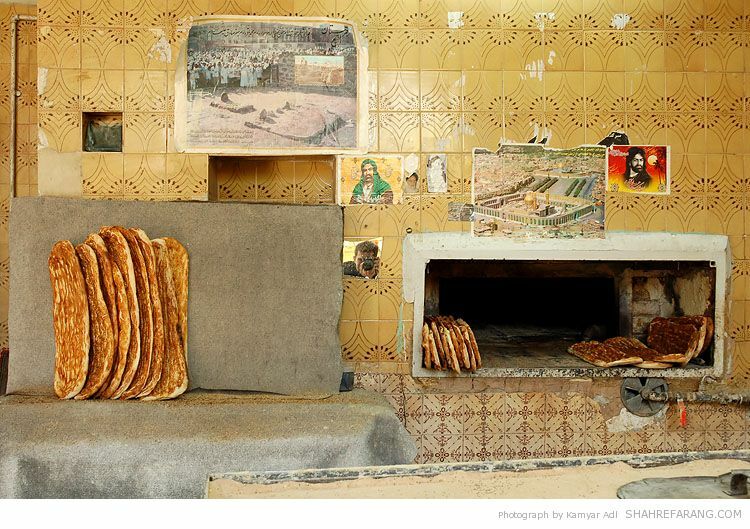 “In Iran, we ate marvelous breads – some of very very simple composition and baking. One type was merely water, flour, and salt in a thin dough baked by pressing it against the walls of a stone oven for a few minutes until it fell off. It sounds like something kids might do, yet it had a distinct identity. I did a little Google research to revive my Iranian memories. 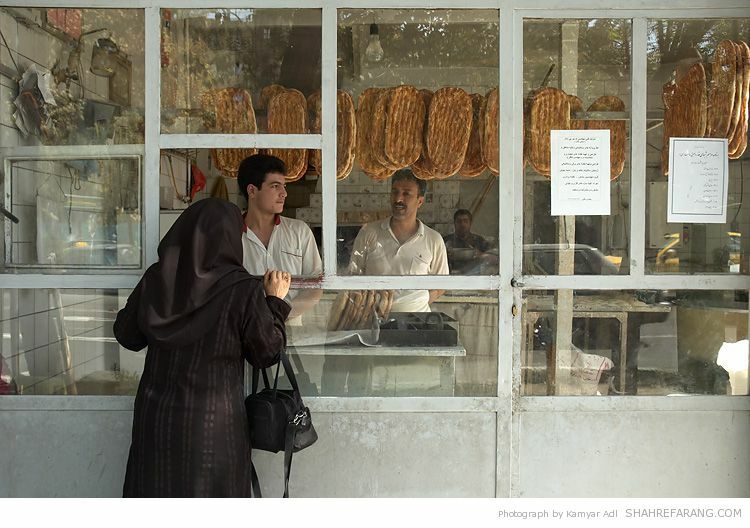 The three types of bread that were most common in Tehran were sangak, lavash, and barbari. They were all somewhat similar to Indian naan — thin and best served immediately. 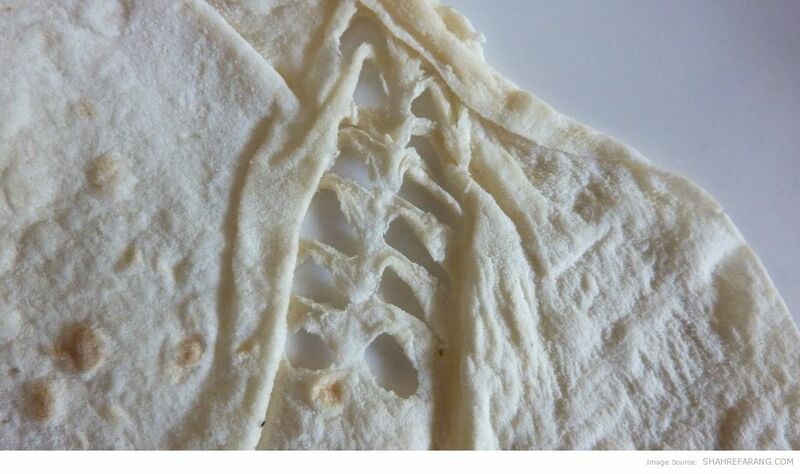 Lavash is the one made by pressing the thin oblong against the wall of a hot stone oven. It cooks in a minute or so. Sangak, also just water, flour, and salt, is rolled out and baked over a bed of very hot pebbles, You need to brush away remnants of the pebbles before eating it. 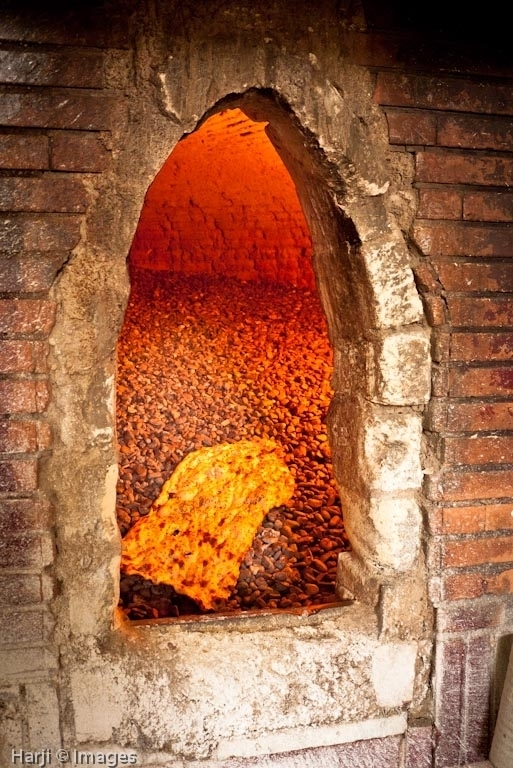 Sangak in oven. [Photo by Muslim Harji at simerg.com]. Barbari, which was my favorite, is somewhat thicker, is slightly leavened, and lasts longer. 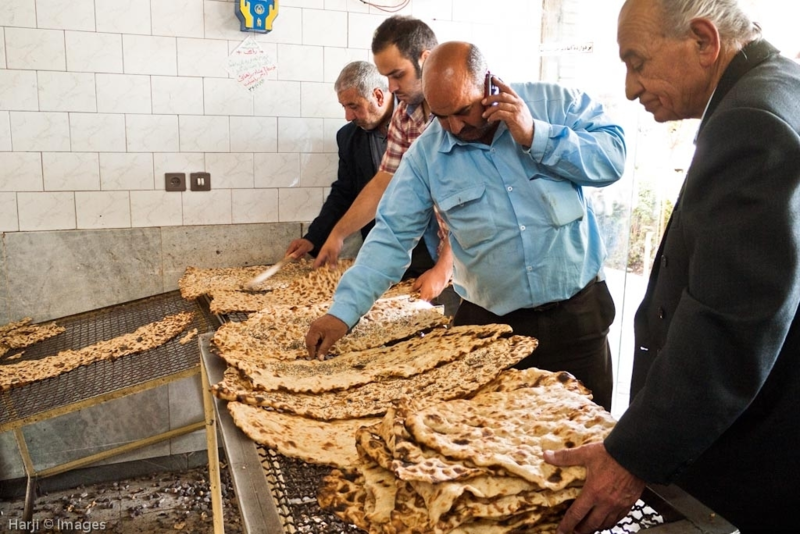 The other two types turn to crackers within a few hours, but barbari remains softer for about a day. The practice was to send a servant to wait in line for the bread twice a day. Everyone queued for bread — odd discipline in a place where otherwise queues were rare. There were other types too, but those are the three I remember encountering most frequently. They all also bear some resemblance to different types of pizza crust. Dante Aligheri’s Divine Comedy, and especially The Inferno, has been known since its publication in Italy in about 1317 for beauty and intense humanity. 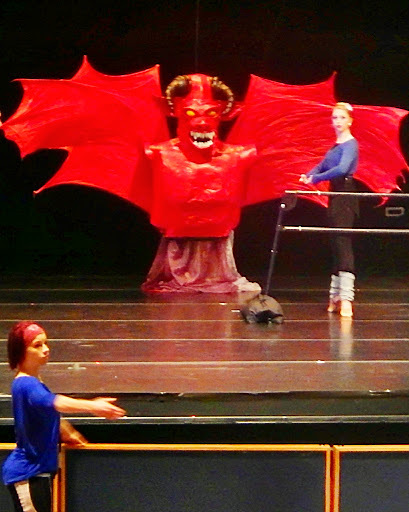 In February 2014, Glenna Burmer’s music, evocative of the strength and imagination in The Inferno was brought to life by Ballet Bellevue (Bellevue, Washington) with the choreography of Ronn Tice and Jennifer Porter. This is an account of the ballet, in rehearsal and in production, with the permission of Dr. Burmer. Dr. Glenna Burmer graduated from University of Washington Medical School in 1981 and started a biotech company in Seattle in the 1990s. She turned to composing music in the mid-2000s, and has produced several concerts in Seattle. Dante’s Inferno is her first ballet. Jim Carns and Glenna were lab partners in medical school, and he worked with Glenna in her biotech company for several years as a pathologist. Anthea Carns worked with Glenna as the webmaster, production assistant, and finally assistant stage manager for The Inferno. 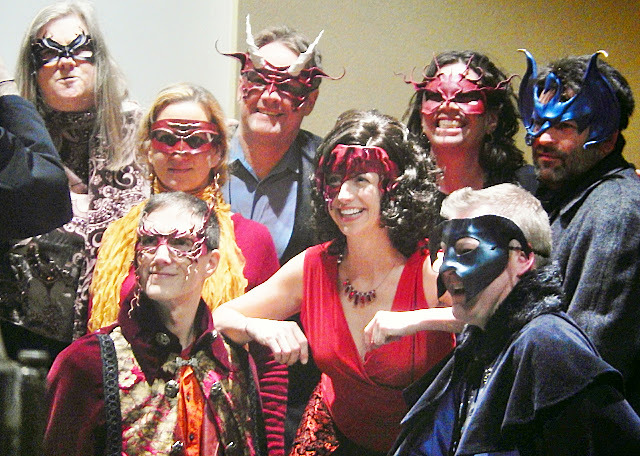 Jim had the opportunity to be a (non-dancing) demon in the production, and thus we had the great good fortune to be part of this production. Glenna staged Dante’s Inferno as one of three pieces, each representing an aspect of the themes of the Underworld and the other worlds, and the sacred and the profane.Demeter and Persephone with music by Tim Huling and choreography by Ronn Tice explored the Greek myth of the origins of the seasons. 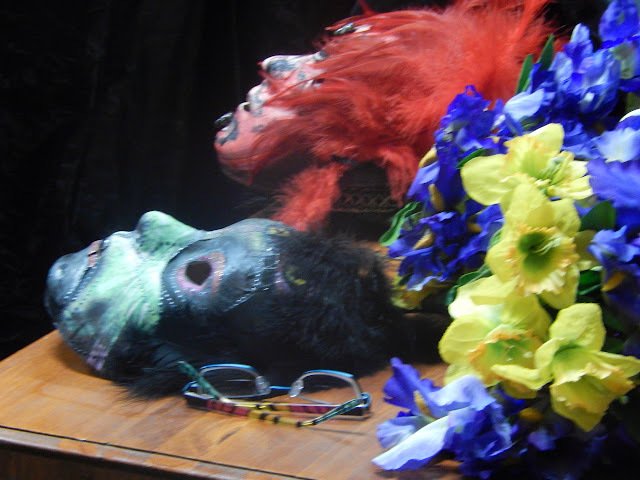 When Hades, lord of the Underworld, kidnaps Demeter (goddess of the harvest)’s daughter Persephone from a spring time meadow, Demeter mourns and the earth grows cold and barren until the gods cooperate to return Persephone to the earth. Although Persephone must return to Hades for a few months each year (winter), when she is on earth with Demeter, everything flourishes. Sacred and Profane, with music by both Glenna and Tim, and choreography by Jennifer Porter, explored the dual aspects of a dancer’s being, showing them distrusting each other, but in the end, joining in harmony. Glenna began writing music in the mid-2000’s (http://www.glennaburmer.com/Glenna_s_Music_A9GT.html), and most recently composed the music for the Dante’sInferno ballet. 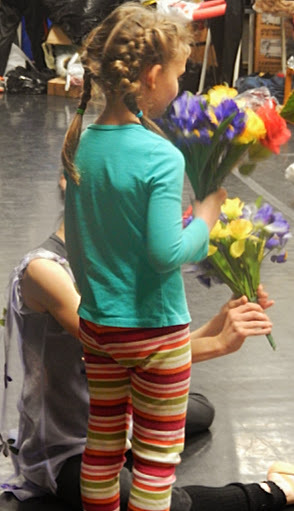 The production was a benefit for Ballet Bellevue (http://www.balletbellevue.org/), which provided many of the dancers, as well as the rehearsal space, and some of the administrative assistance. Ronn Tice (http://www.linkedin.com/pub/ronald-tice/4b/62b/a1b) and Jennifer Porter (http://www.balletbellevue.org/jenniferporter.php) were choreographers, and Fred Burmer (Glenna’s dad, a professional photographer, http://www.glennaburmer.com/Burmer_Art.html) did most of the show photography. There will be a video, available on the website. 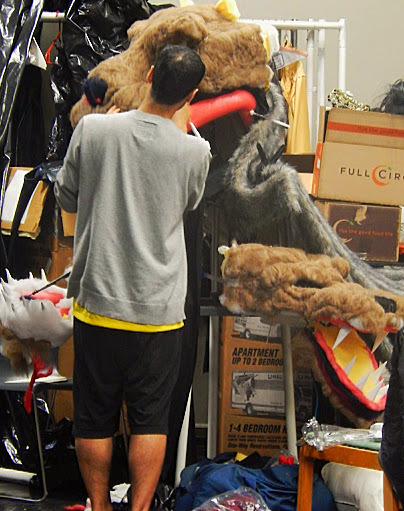 All of the production photos are from the website and FaceBook pages, and are (except as noted) by Fred Burmer. 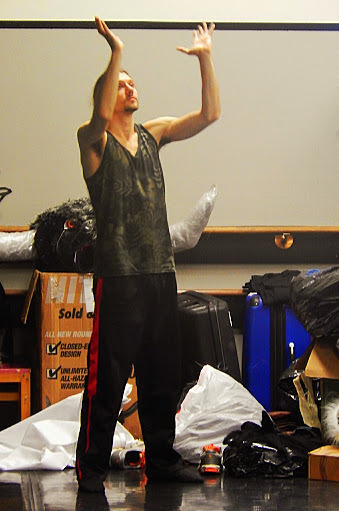 All of the rehearsal shots are by Teri White Carns, with permission of Glenna. 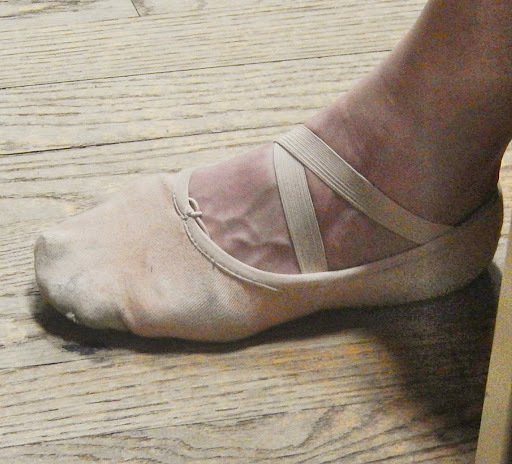 A dancer’s foot at rest [TWCarns photo]. Ballet (from Italian, ballare, to dance) — The Pittsburgh Ballet Theatre website puts its origins in the 1600s in the French royal courts [http://pbt.org/community-engagement/brief-history-ballet]. The classical ballet style used in Dante’s Inferno by the choreographers relies on a “vocabulary” of movements that was developed in the 1800s. Anyone who took ballet classes knows of the five positions for the feet, and five for the arms. There are bends, jumps, spins, and rising to the ball of the foot or the toes. From these positions and a few more, all of the classical ballet stories are constructed. In the French courts in the 1600s and early 1700s, ballet was combined with opera, but since then ballet dancers are silent. 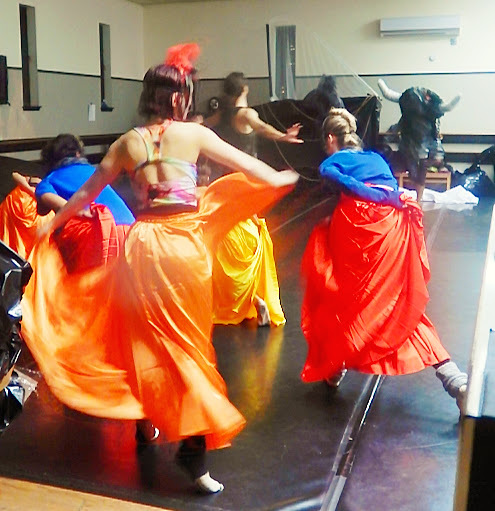 The dance movements and the music convey the narrative. 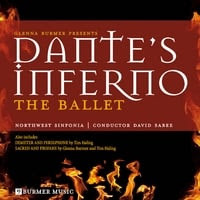 Here is the web site’s account of the history of the Inferno [http://dantesinfernoballet.com/Inferno_StoryandMusic.html]: “The ballet Dante’s Inferno is based on the first part of Dante Alighieri’s magnificent poem, the Divine Comedy, which chronicles Dante’s journey through Hell (Inferno), Purgatory (Purgatorio) and Paradise (Paradiso). Dante was born in Florence, Italy, in 1265, during the early Renaissance period of two warring political factions, the Guelfs and the Ghibellines, who were loyal to either the Pope or the Holy Roman Emperor. Dante was passionate about politics, and also about Beatrice, the first love of his life, who played an important role in his poetry. Although Beatrice married another man and died when Dante was 25, for the poet, she was the idealized representation of all of the heavenly virtues, and his guardian angel. The story opens with Dante waking in a forest. The Roman poet Virgil comes to guide him through the Inferno, which he must traverse before he can go through Purgatory into Paradise. Hell, for Dante, was divided into nine circles, with the first being the least evil — lusts and carnal passions. Lower down are greed, jealousy, fraud, despair, and violence. In the Ninth Circle where Satan resides are the traitors. In the poem and the ballet, Dante traverses all of them, fending off temptations along the way and eventually climbing on Satan’s back to get out of hell and back to the verge of Purgatory where he dances with the three Graces (the counterpoint to the earlier dances with the Furies). From there, Virgil will guide him part of the way to Paradise. A three-headed figure in Limbo, before the actual Inferno, representing three of the great Pagan philosophers who were virtuous but not allowed to enter Paradise because they were not Christian or in the Old Testament. 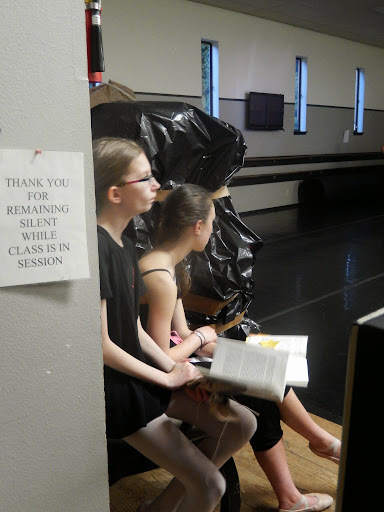 February 15, Ballet Bellevue rehearsal space, the tech line up. 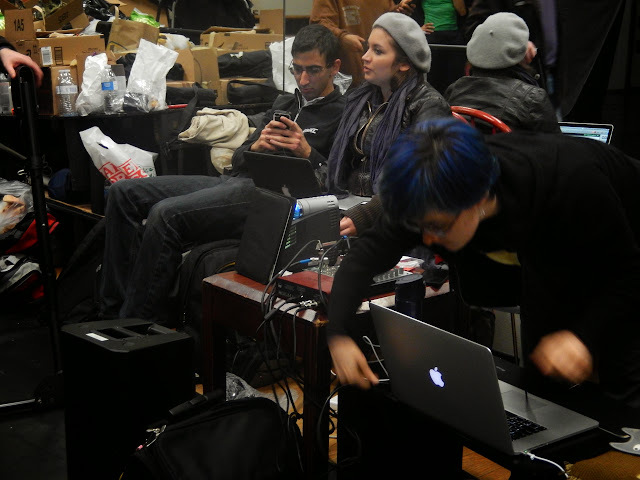 The rehearsal floor is open and free of clutter, but the sidelines were packed with people with computers (e.g., Anthea, to the right in the mid-distance), creatures under construction, and an organized tangle of cords and gear. 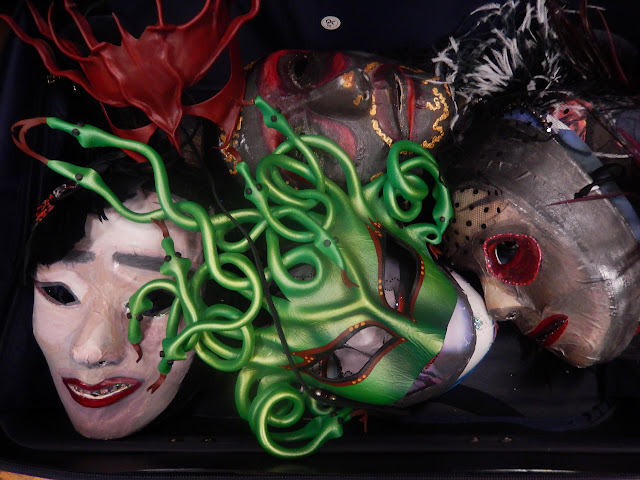 One of the things that struck me most about the experience was the transformation that the dancers and the story underwent between the rehearsal hall and the stage. 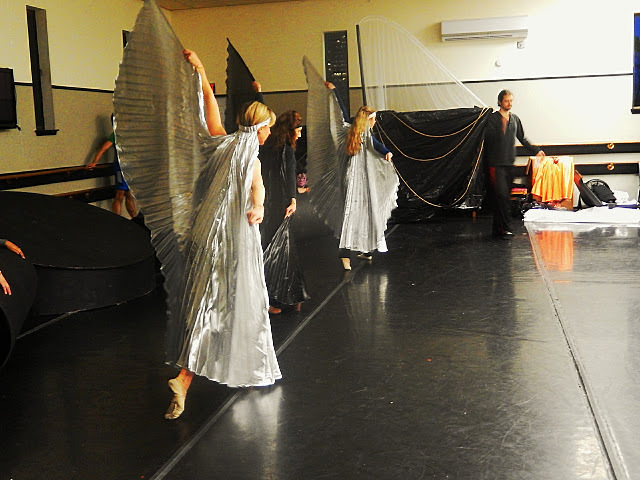 The dancers were beautiful, in motion or at rest, in the rehearsal hall. 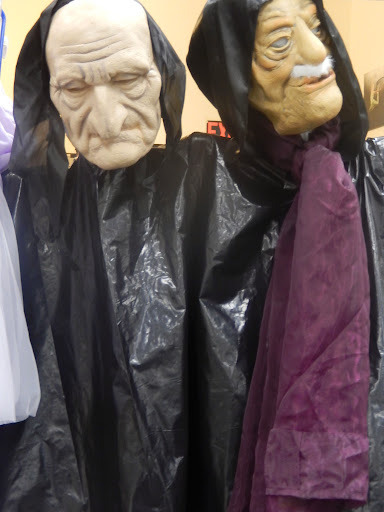 On stage, with the music, the costumes, the lights and sets, they gained a dimension of magic. Fire dancers in production. 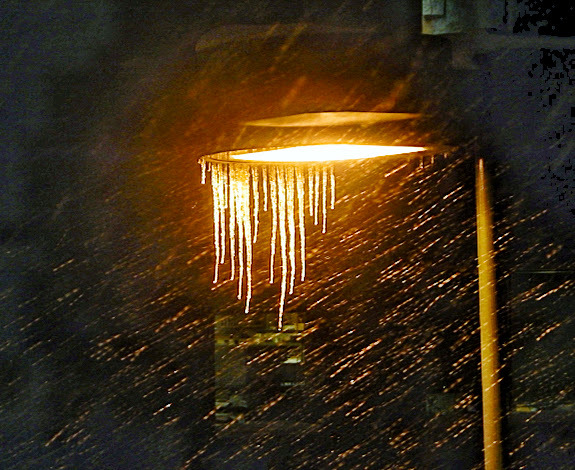 [Fred Burmer photo]. Pre-matinee warm-up in the company of Satan (created by Timothy Stephens) , February 22. 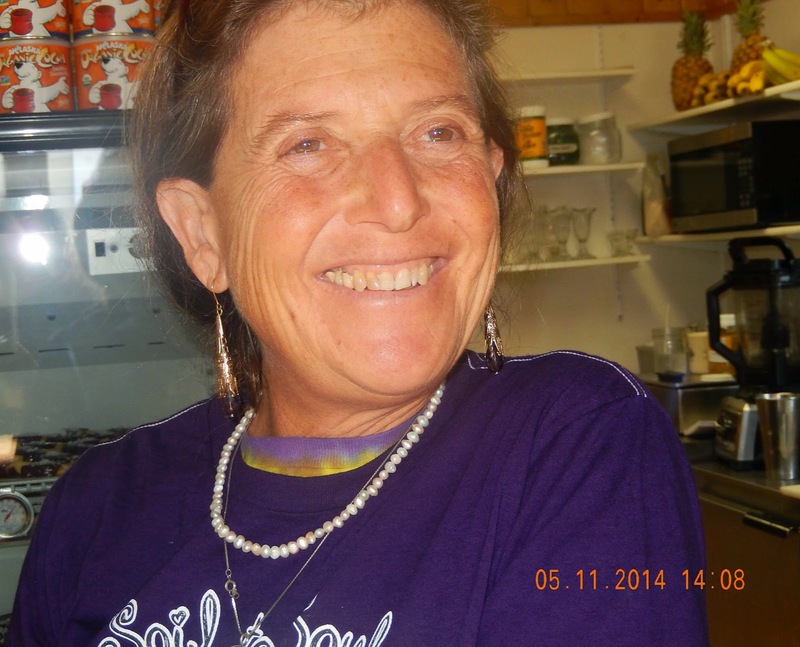 Glenna is writing the music for the other two parts of Dante’s Divine Comedy,Purgatorio, and Paradiso. She hopes to take the trilogy to Italy in the future. In the meantime, she’s also working on music for a performance to be put on in conjunction with the UW Astrobiology department, on a series of commissioned short symphonic pieces based on paintings, and more. You can keep track of her on her website, http://www.glennaburmer.com/Home.html. Anthea is focusing on writing [her blog is at http://runonthewater.wordpress.com/] and driving the foodtruck, 314pie [http://www.314pieseattle.com/]. Jim is back in Anchorage contemplating his next adventure, which is unlikely to involve ballet. Demons are a different question. 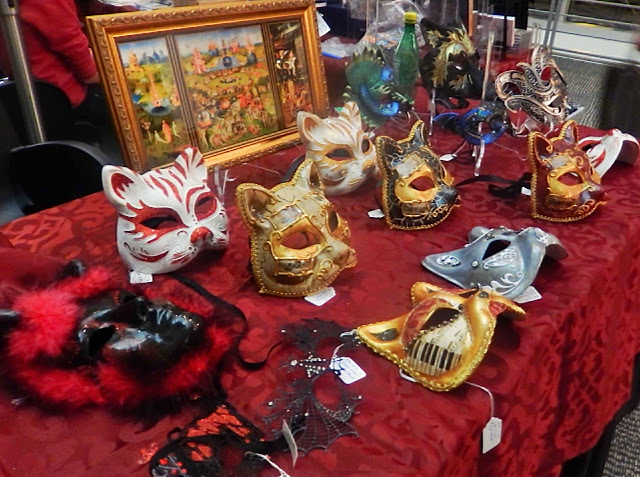 Photo from the website, http://dantesinfernoballet.com/Inferno_StoryandMusic.html. 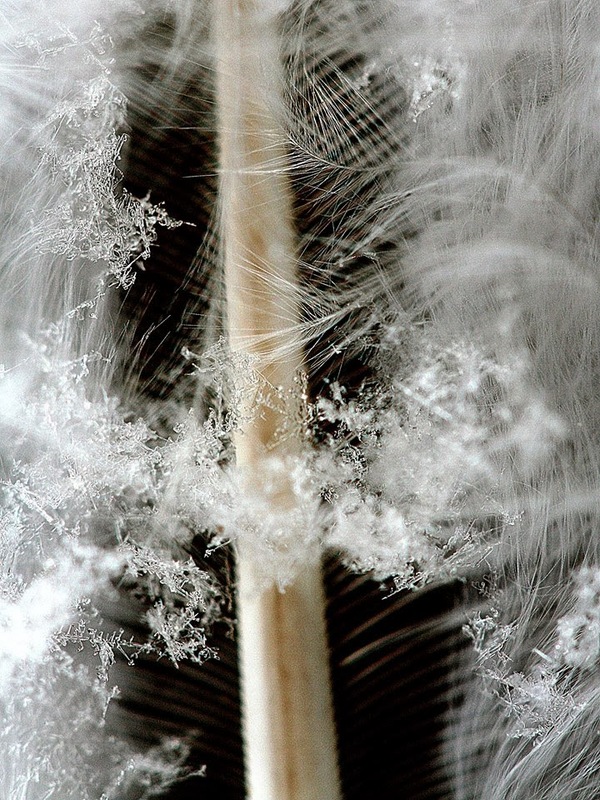 you are soft and yielding. of garlic minced in butter. sharing a bottle of Bordeaux? 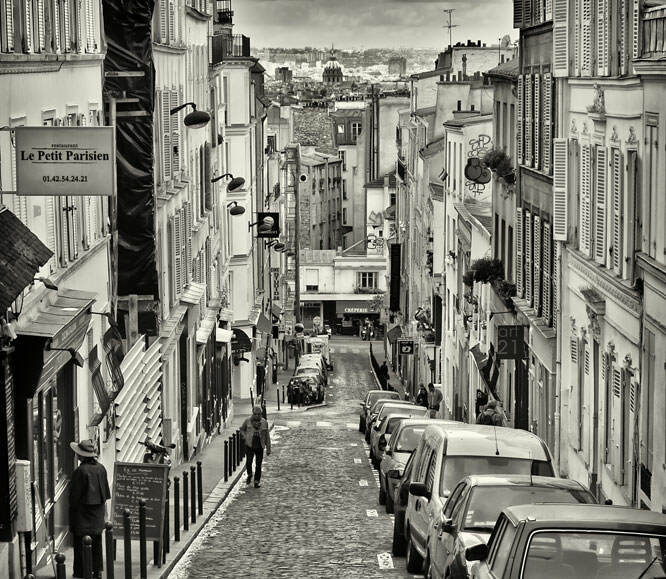 Streets of MontMarte in Paris,, ephotozine.com picture. The dates given in this timeline are the best approximations available at the time of publication (March 25, 2014). Bits of silica in their leaves, to make it harder for animals to eat them. That didn’t prevent numerous animals from evolving ways to consume them anyway — extra stomachs (ruminants like cows, zebras, elephants and deer), big teeth and extra digestive spaces (like horses), and jaws and mandibles (insects). 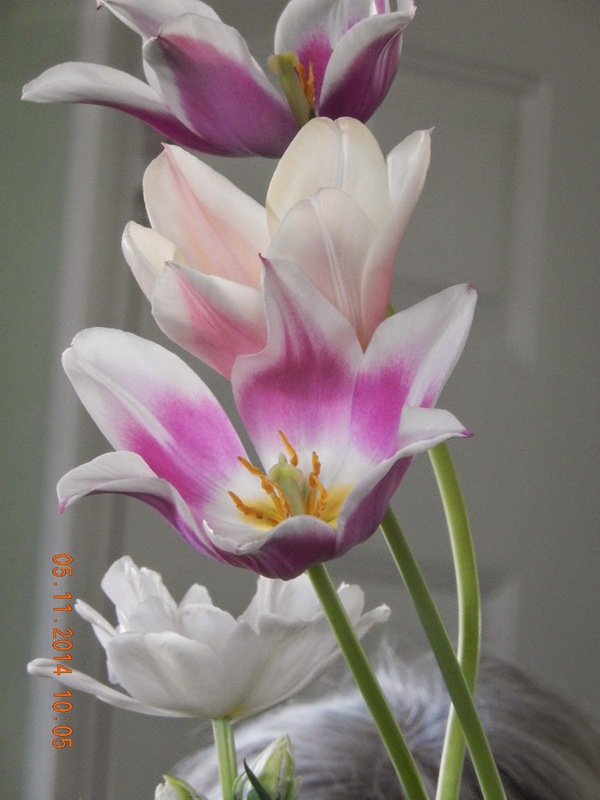 Growth from the ground up, rather than from the top of the plant, which allowed them to survive fires, droughts, winds, and other harsh conditions. Two types of photosynthesis, allowing them to grow in a wide range of climates. Some grasses have C-3 photosynthesis, adapted for tropical climates; the C-4 path of photosynthesis developed more recently and enabled grasses to colonize colder and drier climates, including Antarctica. The ability to propagate both by runners,(above and below ground) and with seeds. 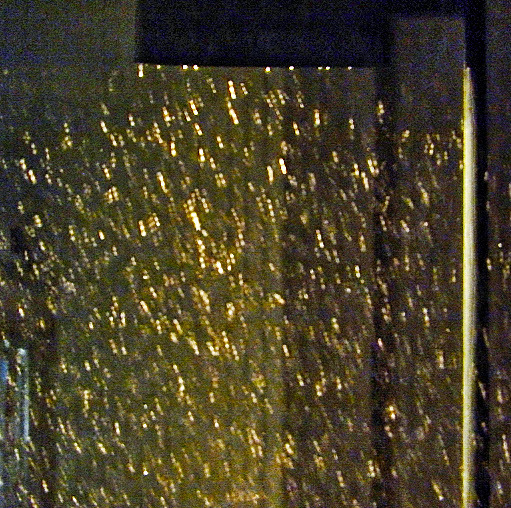 Wind-carried pollen, so that the grasses didn’t have to rely on insects for fertilization. The climate cooperated as well. No-one knows for sure why the dinosaurs went extinct about 65,000,000 years ago, but cooling climates and ice ages after that often favored mammals and grasses. Herds of ruminants and the animals who ate them for dinner covered much of Africa, the Americas, and Asia. Fast forward through many millions of years to the grasslands of Africa where the earliest signs of humans appeared. Savanna, Samburu National Reserve, Kenya. Credit: Thure Cerling, University of Utah. Humans developed their cultures and civilizations in close relationship to grasses. 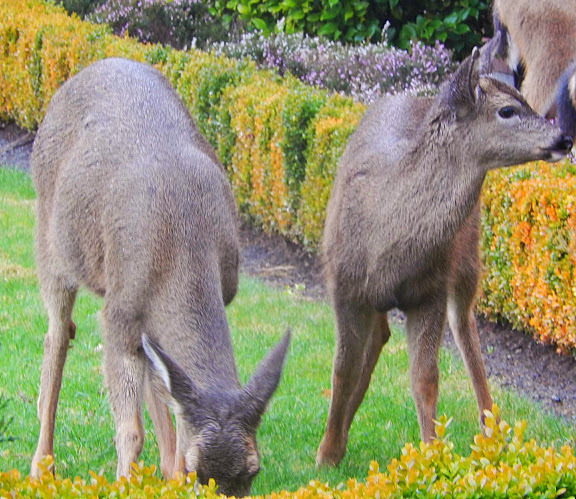 Whether they were feeding themselves or their domesticated animals, or subsisting on wild animals that foraged on grasslands, much of the human diet came — and still comes — from grass. One human ancestor, Ardipithecus, from 4.3 million years ago was eating grass; its members lived in woodlands near the savanna. Other evidence from about 3.5 million years ago suggests that grass was a main component of the hominids (pre-humans) diet, distinguishing them from their primate ancestors who subsisted mainly on fruits, leaves, and insects or small animals. An artist’s image of Ardipithecus. About 2.6 million years ago, humans were making stone tools, in the Kenyan grasslands, and elsewhere, while continuing to eat grasses. At the same time, the climate was shifting from more tropical in most places to drier, cooler, and more variable, well-suited to grasses, as shown by a variety of scientific data, from undersea sediments to fossilized vegetation. There’s plenty of evidence that humans were eating meat at the same time as the grasses and other foods, but data suggest that human kidneys and livers are limited in in their ability to process proteins. Too much meat is toxic, and half or more of human calories must come from fats and carbohydrates such as grains. Wheat is the focus of this blog; others have done great justice to the rest of the omnivores’ diets. 1.9 million years ago — hominids begin to cook? When did people begin to cook grains, whether by roasting them, boiling them, or in some other fashion? The evidence is so murky that it’s probably better to be cautious rather than to say that anyone knows with certainty. One study looked at the size of hominid molars from about 2,000,000 years ago, and suggested that they were much smaller than those of related primates because hominids needed to spend much less time and energy chewing food — only possible if they were cooking it. 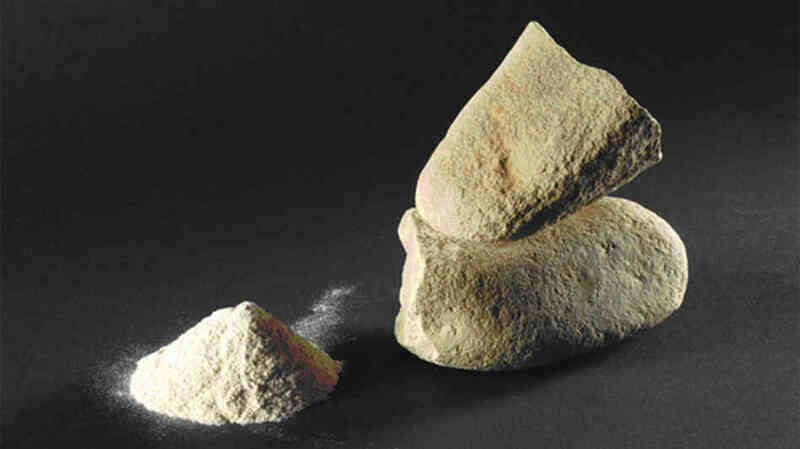 Tools for grinding grains appear well before humans domesticated the grasses with agriculture. Excavations have found stones that were used to grind tubers and grains in Italy, Russia, and elsewhere. 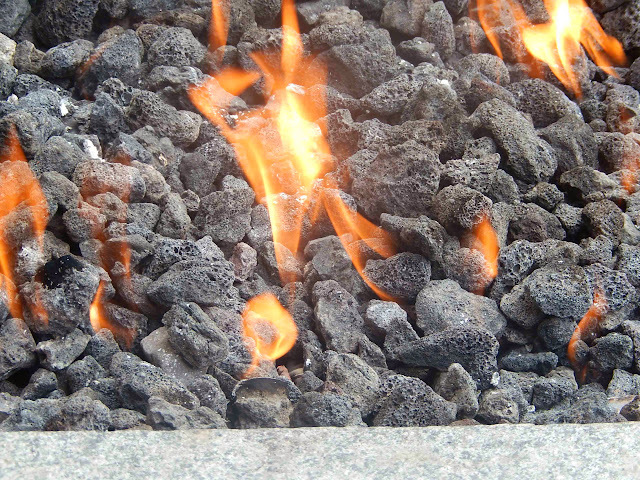 A flat stone found in Israel in 1989 had been used to pulverize barley, and possibly wheat. The earliest evidence of wheat ancestors, such as wild einkorn and emmer, dates from about this time as well. Finally, we get to agriculture when people began to deliberately plant crops — mostly grains — and cultivate the ground. Notice that by the time agriculture begins, people had been eating grains for most of the multi-million-year history of hominds; they had been cooking grains for perhaps two million years; and they had been grinding grains into pastes (and probably cooking the pastes) for tens of thousands of years. 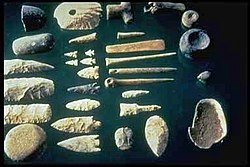 Most of the existing evidence for the earliest farms is from archaeological sites in the Middle East. Agriculture would assure a reliable source of grains and legumes for proteins to supplement meat. People had been eating wild wheats, and they were among the earliest plants to be cultivated. One of the most interesting possibilities for the origins of agriculture comes from a site in southeast Turkey, Gobekli Tepe, where excavation began in earnest in 1994. Stones, some that are sixteen feet tall and quarried with flint tools from about 11,000 years ago suggest a temple or burial site. Many have sophisticated carvings of everything from lions to snakes, vultures to spiders. Twenty miles away, a village site contains the earliest evidence of domesticated wheat, from 10,500 years ago. Within a few hundred years after that, signs of domesticated sheep, cattle, and pigs appeared in the area. Klaus Schmidt, the archaeologist who began excavating Gobekli Tepe suggests that the need to care for the large numbers of hunter-gatherers while they were building the monuments led to villages and thence to agriculture, rather than (as has often been thought) agricultural settlements leading to formal religions. Thousands of years ago, farmers selected the strains of wheat that held onto their grains (had a rachis, or stem for the grains, that did not shatter when the grains were ripe) — so that the seeds stayed on the stalks until they could be harvested rather than scattering to the winds. 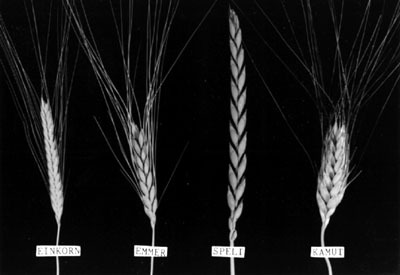 Farmers also selected wheats that did not have tight hulls, because these were easier to thresh. Today’s bread wheat, Triticum aestivum exists only in cultivation, and “was hybridized from cultivated emmer and the wild grass Triticum tauschii,” about 9,000 years ago. Dr. Borlaug, in the Green Revolution during the 1950s, won a Nobel Peace Prize for hybridizing wheat that was much shorter, so that the stalks didn’t topple under their own weight before harvest, or get blown down in summer storms. He also developed wheat that was far more productive, although it did require substantially more nitrogen-rich fertilizer. Monsanto, characterized as the world’s largest seed company, said in January 2014 that although no genetically modified wheat is grown anywhere in the world today, it was coming closer to marketing one. The company halted field testing in 2004 because of resistance from potential foreign purchasers and others. Plants from genetically modified seeds would resist destruction by glyphosphate, sold by Monsanto as Round-up. The weed-killer is already widely used on Monsanto’s patented GM corn, soy and other crops. One source suggests that consumers are less concerned about using the herbicide on those crops because they are more widely used as animal feed or biofuels than as food for people, like wheat. 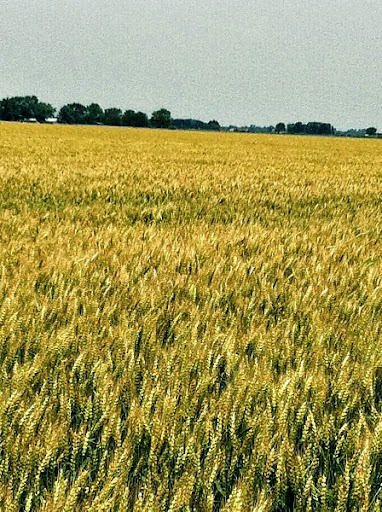 Wheat’s future, despite many concerns about celiac disease, gluten sensitivities, and its healthfulness, seems assured after so many years of serving as one of the most important foods in many parts of the world. The great majority of people are not sensitive to gluten, and wheat provides substantial percentages of the protein, carbohydrates, and nutrients needed daily. Find a tuna among the market vegetables, a solitary man of war. Pair it with artichokes, their sides burnished as grenades. Take them in your market basket, home to the deep soup pot. I am envisioning a Sicilian fish stew, one where you start by sauteeing the small diced onion and smashed cloves of garlic (two, maybe, or three) in olive oil that smells of the dusty October hillsides where it was harvested. After the onion and garlic have scented the kitchen, stir in the baby artichokes, two dozen or so cut into quarters, and stir them sizzling but not burning for a good five minutes. Then it will be time to splash in half a dozen crushed tomatoes, red with the blood of the New World from which they came, along with the chopped green celery stalk and its leaves, and the bright bitter parsley — enough to bring summer into this autumn dish. You will stir this with salt and pepper (“to taste,”as all of the good books say), half a glass of white wine, a cup of stock (fish or vegetable) and simmer for half an hour, while you turn back to the noble tuna, the missile that has become a missive, a letter from Pablo Neruda to your kitchen. 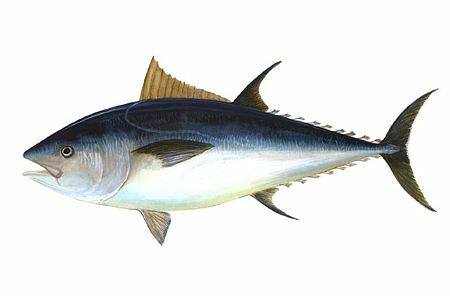 Now you must bravely cut the tuna into one-inch pieces, of a size to cook quickly and tenderly, each piece a word, and all of them together a pound of the red muscles that propelled the tuna through the deeps. When the artichokes have let down their guard and are al dente, slip the tuna chunks into the pot, and quickly toast some slices of ciabbata that have been brushed with more of the olive oil. They will be done at the same time, the tuna and the toasted bread, and you may ladle the stew over the slice of bread in the bottom of each bowl. Some would fling more parsley atop the stew, or a lemon aioli, or some other garnish. You must be the judge. Take the bowls outside, sit with them under the fig tree in the evening, and drink a wine from the slopes of Mt. Aetna with your meal. you. I make a stew. My thanks to the poets of “Ten Poets” in Anchorage for their thoughtful and helpful comments. Christmas gifts of years past. The Magi traversed wild deserts and hostile trails seeking the new-born king whose star they saw. They went to Bethlehem to take the baby gifts — gold, frankincense and myrrh — things of this world, material things. Why, when we are told so often and so harshly that Christmas is too materialistic, would the Three Kings have been the first to bring the Christ Child gifts of this world? In the Catholic teaching, God gave us bodies, and a world of plants and animals, seas and mountains, fields and orchards to live in. Then God became human to live among us — in the Catholic teachings, fully God and fully human. He broke and ate the bread, drank the wine, laughed with his friends, and walked the dusty paths of Israel. He welcomed the material gifts, like the ointment from the woman who washed his feet. We owe it to the God who shared these gifts of shape and form, taste and sound with us to appreciate them and in our turn, share them with others. Instead of rejoicing in gifts this season, we wail about the materialism of the world, and the burdens of giving. It can be tough. We feel pinched for time and money. The demands appear insatiable. Who has any idea what a teenage boy wants — that we can afford or appropriately give him? Or a friend of exquisite taste? Or someone living out their last days asleep in a nursing home? Not to despair — there is always something to give, from a tech-friendly gift card, to an hour sitting beside the sleeper as a quiet companion. If we don’t want to take the Christian view of the season, we can see the holiday as a chance to show our deep delight in the world we live in. The fact that we are body intertwined with spirit means that our relationship with everything around us is one of interaction. It is not given to us to reproduce just in the most physical sense. Every time we cook, garden, clean, create a song, make a child, throw a pot, write a story, we share in the creation of and maintenance of the world. Resting, enduring, pushing the Sisyphean rock up the hill, we share in the creation and maintenance of the material world. It is our gift and our task. 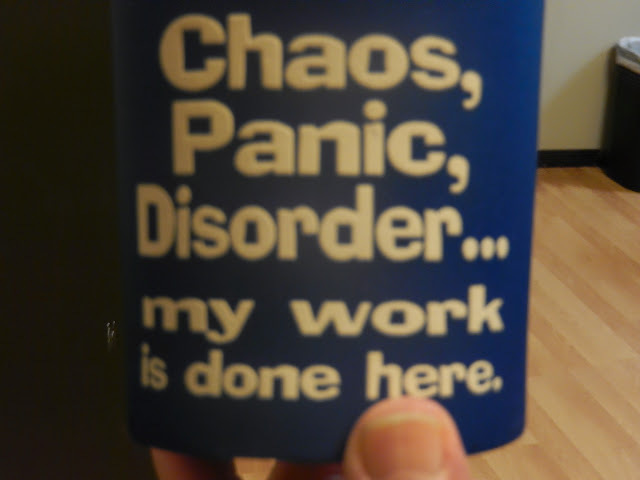 As artists, we have even more responsibility. If we don’t share the things that we create with our talents as gifts to others, and recognize the talents of our fellow artists by giving others their work, how can we think that people in general will take the time to do that? It doesn’t seem to me to be an either-or. Each aspect, material and spiritual, supports and enlarges the other. 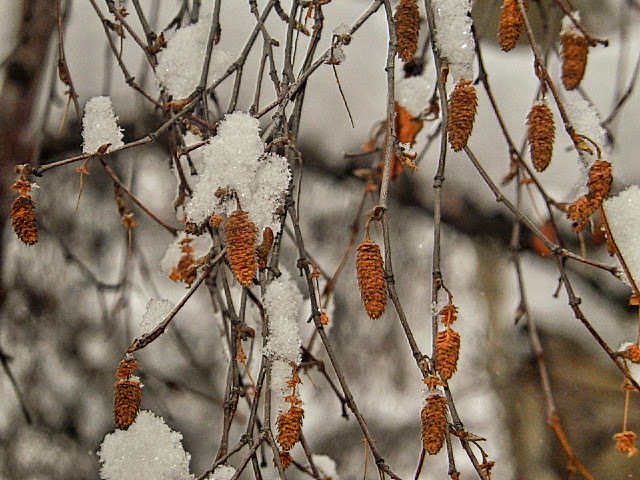 Snowflakes, a gift (Micki Glueckert, December 8, 2013). 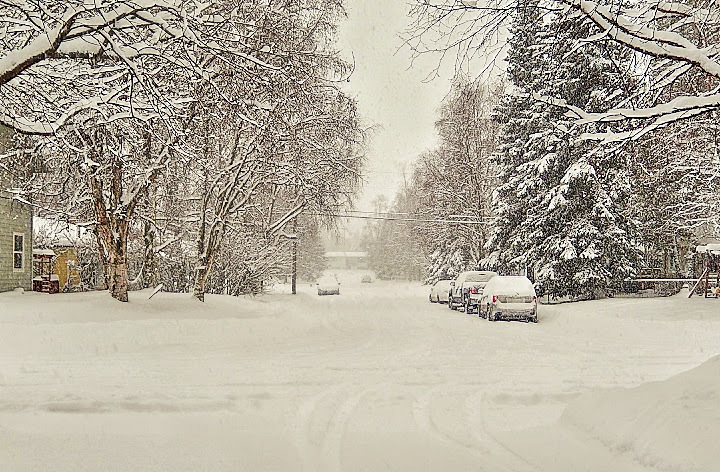 Sounds like most of our friends are getting enough snow for a white Christmas. 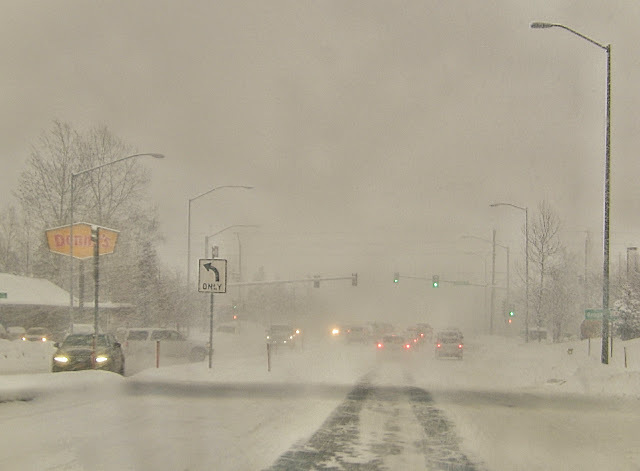 Just in case Anchorageites were feeling that theirs was a little grubby and worn out, we got about a foot yesterday and today, with more coming. Here’s what it looked like today. 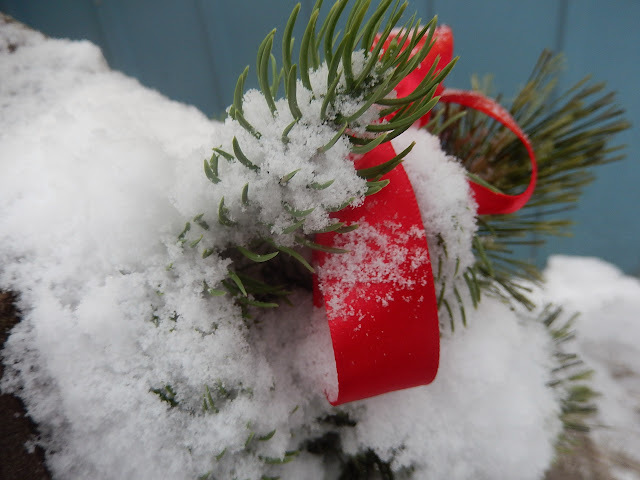 A snow-covered Christmas bow at Fire Island bakery where we began the day. 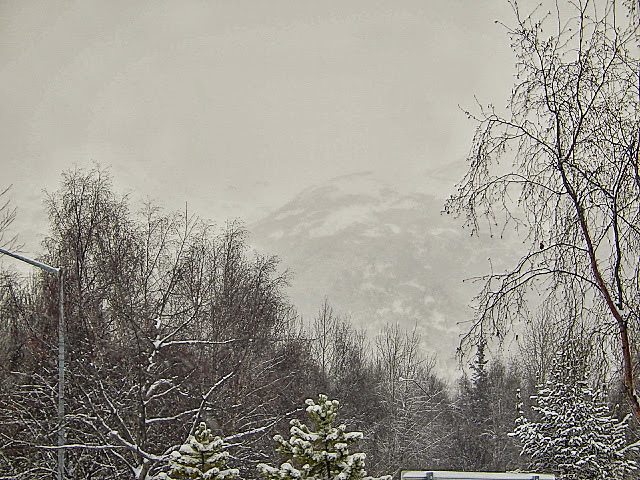 View from the Costco parking lot, looking toward the Chugach mountains, 11:30 a.m. 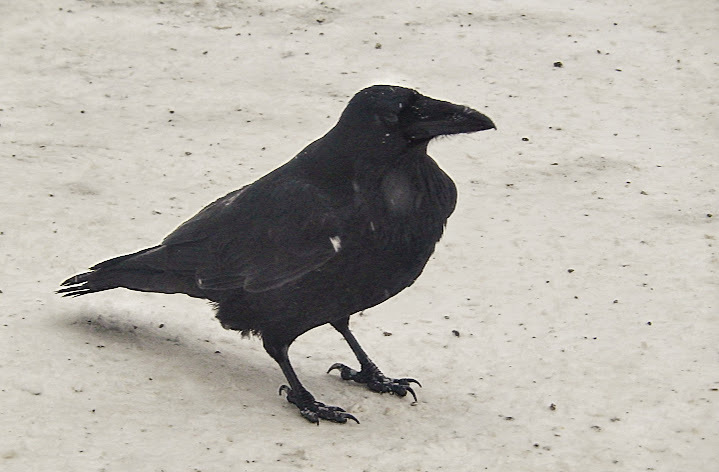 Parking lot raven. They are remarkably black — eyes to toenails. 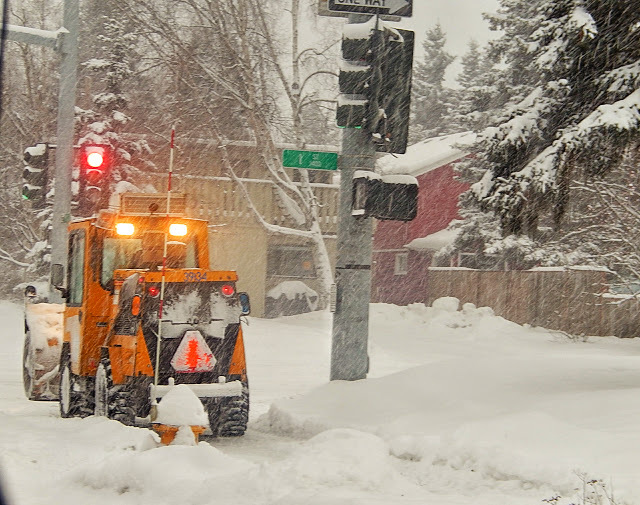 Sidewalk plow at I Street. 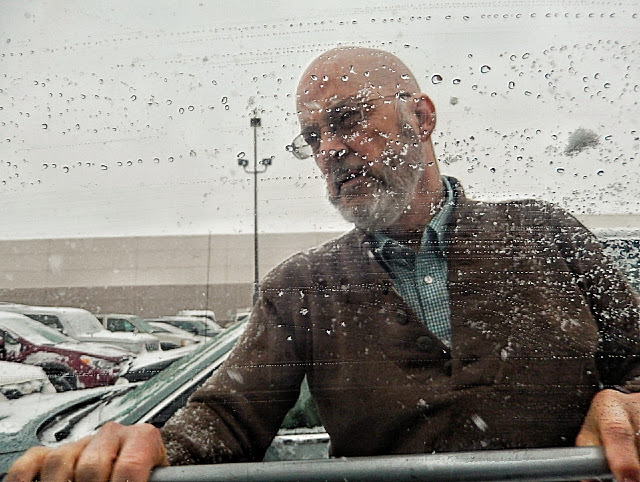 Jim cleaning the car windows, one of many times today (I offered to help, but he was having too much fun). Low visibility on DeBarr Road . . . and everywhere else. 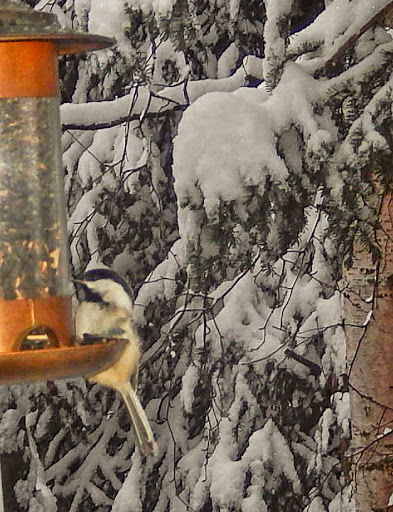 Black-capped chickadee at the bird feeder. 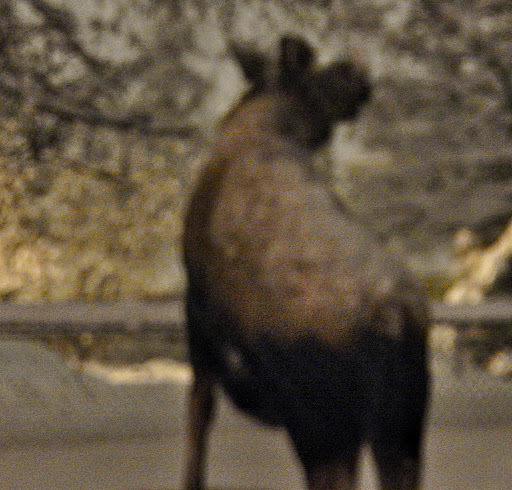 Neighborhood moose, browsing at 5:00 p.m. — too dark to get a clear photo. 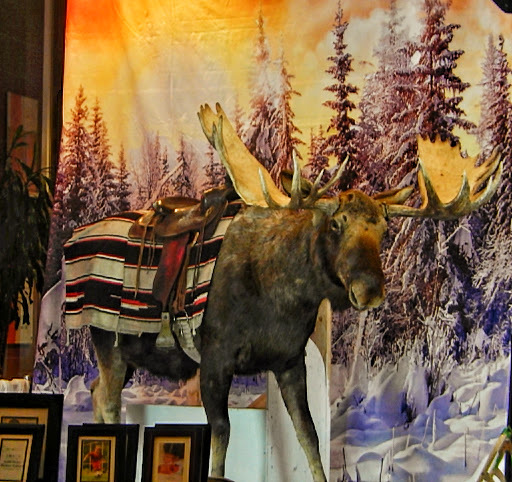 Stuffed moose at the Fifth Avenue Mall waiting for people to come and have their pictures taken. We wish all of you delightful days in the next few weeks.